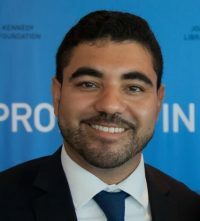 Antonio Caban, a recent George Washington University graduate, used his master’s in political management to build his own unique career in the media field. A former political journalist, Antonio currently works as a producer for WGBH, a PBS station out of Boston. Antonio wanted to explore his passion for politics and develop into a more well-rounded journalist. After researching the George Washington University School of Political Management, he realized it was the perfect fit for his specialized career. Despite his immense workload as a journalist, he was able to earn his online master’s from GW around his schedule. While covering campaigns and working for the State House News Service, he applied his new political knowledge directly to his writing. Antonio chose GW’s political management program to help shape his career goals. He wanted to marry his two passions of politics and journalism, and GW’s program was able to help him carve out his own distinct career. GW’s curriculum provided a bare-bones look into the political process and the reasoning behind every incremental movement. These behind-the-scenes lessons continue to impact Antonio and his career today.